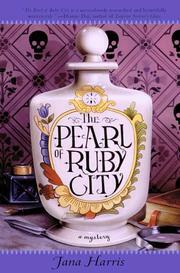 The author’s second novel (Alaska, 1980) is set in Ruby City, a Washington State mining town, in 1893. Young Pearl Ryan has fled there, escaping the false charge back in New York that she stole her employer’s diamond necklace. In Ruby City she runs the Laundry by the Lake, helped by Mary Reddawn, a Siwash Indian, and Mary’s husband, Chin. Saving her earnings for medical school Pearl also assists Doc Stringfellow when the need arises. They—ve been unable to save much-loved Mayor —Shaky— MacDonald from what the doctor has diagnosed as typhoid. His death is quickly followed by that of Jake Pardee, owner of the gambling hall and Trading Post, killed by a shot in the back. The mayor’s close friend Dutch Wilhelm is the next to sicken and die, with more mysterious deaths to follow. Pearl is determined to find out what’s behind it all, and she succeeds, even as she discovers the betrayals of her own past. Harris’s choppy narrative, packed with local color, determinedly eccentric characters, and nasty confrontations, never achieves flow or focus. Best enjoyed by fans of the Old West.